Benecos Natural Kajal Eyeliner in Olive will enhance your eyes to give definition to your eyes. This Olive Kajal Eyeliner is perfect for highlighting and defining your eyes or for adding colour to your complexion. 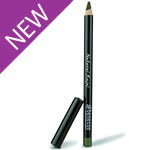 This Natural Kajal Eyeliner in Olive will beautifully define your eyes. Whatever your eye colour blue, green, brown or hazel we have a Natural Kajal Eyeliner which will expertly define, highlight and enhance your eyes.